"These cute cupcakes are fun for everyone! Make them for parties or other times when you just want an easy cupcake! Top with desired icing or just eat plain!" Place the oven rack in the center position. Preheat oven to 375 degrees F (190 degrees C). Beat sugar and margarine together in a bowl using an electric mixer on medium speed until creamy and smooth. Beat in eggs, 1 at a time, on high speed until incorporated. Mix in vanilla extract. Mix flour, baking powder, and salt together in a separate bowl. Stir flour mixture, alternating with milk and ending with flour mixture, until just incorporated. 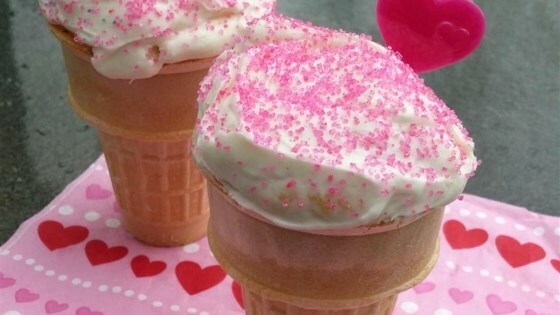 Spoon batter into each ice cream cone, filling to within 1/2-inch from the top. Set filled cones on a baking sheet. Bake in the preheated oven until a toothpick inserted in the center of the cake comes out clean, 15 to 20 minutes.